“Fashionality” is a newly coined term that refers to the visual culture and semiotics of dress and adornment. Combining the words “fashion,” “personality,” and “nationality,” it suggests the interplay between clothing, identity and culture. Reflecting wide geographic and cultural diversity, this exhibition focuses upon the ways in which the concerns, identities and aesthetics of those living in Canada are expressed, deconstructed and reconfigured through the idiom of dress. This blog records exhibition-related information, as well as work and events related to artists appearing in the show. tweed, human hair, wood, glass, text, photographs, 1992. Collection Musee d'art contemporain de Montreal. Barbara Pratt, "When I leave I'll wear my red skirt." 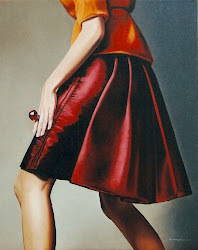 Oil on canvas, 2007. Three artists speak about their work. Fashionality E-Flyer: Please pass it on!